In earlier posts about dark matter, I’ve written about how neutrinos would seem to be a good candidate, but there simply aren’t enough of them to account for all of dark matter. As far as we can tell, there are three types (flavors) of neutrinos, and we know the upper limit of their mass from the distribution of galaxies in the universe. So the three known neutrino flavors can’t be the solution to dark matter. But there has been speculation that a fourth type of neutrino could exist, known as a sterile neutrino. Sterile neutrinos wouldn’t interact through the weak nuclear force the way regular neutrinos do, but instead only interact with things gravitationally (hence sterile). If these neutrinos had a much greater mass than regular neutrinos, then it could be an answer to the dark matter problem. But the catch is that their gravitational interactions would have interacted gravitationally with matter in the early universe, and this would affect the fluctuation patterns in the cosmic microwave background. So in principle we should see their effect in CMB fluctuations. 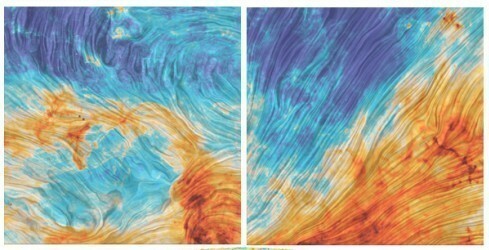 Previously the WMAP observations of the CMB were inconclusive. The data agreed with the 3-neutrino model, but the effect of a sterile neutrino couldn’t be excluded. But the latest Planck results now confirm that there is no fourth neutrino. The standard model of particle physics remains successful. This is good news for the standard model, but it eliminates one more dark matter candidate from the list. I wonder if dark matter can have an event horizon, just like black holes do, hence the difficulty in detecting it? If dark matter occurs on a large scale would that mean that large celestial phenomenon would be gravitationally aligned with them, or in any other way? Apologies, aligned with it I meant. I feel sad when i realize how scientists crave for explanatons with such little data. Could be worse. They could be people who feign ignorance despite mounds of data.